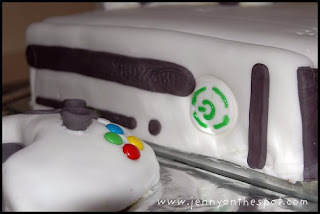 This year I was inspired to make my son an x-box cake for his birthday. I really wanted to try my hand at fondant this time. I thought the 360 with it's white smooth surface would give me some advantage for my first try. I was really pleased with the end result. Although the scale was a bit off, the spirit of the cake was captured for sure. 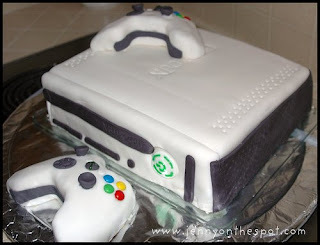 Some of my favorite details of the cake were the knobs on the controllers which I molded with gum paste, and the venting in the console on the top and sides which I made using a meat thermometer (wired, I know... but just the right tool). Oh, I also really liked how the power button turned out. I used store bought green gel from the cake section. I will caution you that one of the unexpected side effects of making this cake is now when I play x-box I have an almost uncontrollable urge to lick my controller. 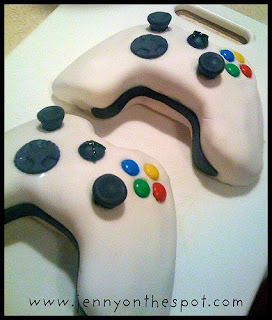 Cake Specs: 5 box cakes with pudding in the mix (1 box for controllers and 4 boxes for console), 4 lbs of my favorie store bought fondant (Home Cake in Seattle) a bit of gum paste, black food coloring, dark chocolate M&M's and about 9 hours (including baking time). My sister in law Jenny posted these pictures on her blog www.jennyonthespot.com and I am so grateful to her because my pictures didn't turn out very good. Thanks Jeanie! Check back for more of Ace of "Kerry" creations! Not sure this is my thing.